GOVERNMENT is doing its best to bring about an economic turnaround and results will start showing in the coming few months, Acting President Constantino Chiwenga said yesterday. Addressing thousands of congregants at the National Thanksgiving and Dedication Service organised by the Faith for the Nation Campaign in Bulawayo, Acting President Chiwenga acknowledged that the country was going through a difficult time but urged Zimbabweans to be hopeful and continue working hard. "Our nation is going through a difficult patch. Our children need jobs and better prospects. Government is doing its best to bring about a turnaround in the fortunes of our nation. We're confident that our economy is on the path to recovery. "Things will start to look up in the coming months. Before long, our nation will prosper, in spite of those who want to see us down. I'm happy and truly grateful that the church continues to preach against sanctions. We follow your efforts with keen interest," he said. He said the church was doing a good job complementing Government in its re-engagement drive. "Let's not give up for God hears and answers the cries of his people. As a nation we need to build a united front and speak with one voice against sanctions. "We have many resources, all of them God-given and we're a hardworking people, thanks to the discipline and the work ethic which the church has inculcated in our people," said Acting President Chiwenga. He said the national leadership was fully aware of the situation in the country and called for perseverance. "Many of us cry over sanctions and all the difficulties they have wrought on our lives. As your leaders, we fully understand your craving for all things to be good, easy and beautiful but the scriptures plainly and loudly tell us finding our own corner of the earth is no walk in the park. You struggle, sweat, bleed, suffer or even die for that which is yours. Our nation went through all these tribulations and continues to be punished for recovering that which rightfully belongs to it," said Acting President Chiwenga. He said the church has a key role to play in working with the State in building the country and promoting peace and love. "I'm not tempting the church away from its divine path but only reminding it of its secular duties. As congregants we're the body of Christ and as citizens we're the bodies out of which God has made our nation of Zimbabwe the same way he moulded the nation of Israel out of all who belong to it. "Nations are built on fraternal love not on hate and derision yet we see much of hate and spite nowadays. We see hate speech and ill-will even flowing from the pulpit. We can't build God's nation on negative sentiments, more so when it comes from those who must radiate love and show the path of virtue," he said. He condemned church leaders who incite violence in churches. "Lately we've witnessed men and women of the cloth grabbing one another by collar, calling each other names and throwing pieces of furniture at each other in the House of God. What an abomination! "The church should not succumb to bodily urges, but preach peace and love in the world, teach us to revere the elderly and preach forgiveness and reconciliation," said Acting President Chiwenga. On behalf of President Mnangagwa, the Acting President wished the nation a prosperous New Year. 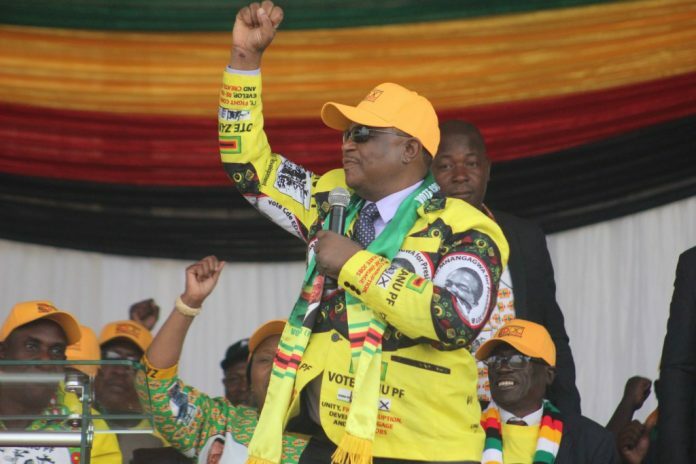 Prophet Andrew Wutawunashe, who is the Faith for the Nation Campaign chairman commended Acting President Chiwenga for working in unity with President Mnangagwa and Vice President Kembo Mohadi for the development of the nation. He said their unshakable unity continues to be an asset for progress in the country. "No matter the challenges we're facing as a nation we know we'll always stand firm and united because our leaders are leading by example. ''The Lord will definitely continue to grant us peace and unity and 2019 shall be a year of progress for the new dispensation," said Prophet Wutawunashe. Before the service ended, Prophet Wutawunashe and other church leaders prayed for Acting President Chiwenga and the entire nation. Provincial Affairs Ministers for Bulawayo and Matabeleland South, Judith Ncube and Abednico Ncube, the Deputy Minister of Industry and Commerce, Raj Modi, senior Zanu-PF officials and leaders of different churches graced the occasion.